If you’re in the market for a new high performance vehicle that won’t break the bank then the Chevrolet Camaro ZL1 may be right up your alley. The very quick car gets dangerously close to the Corvette Z06 in specs, but it offer a bit of practicality with its rear seats (although they are only really suitable for younger children). The 650 horsepower supercharged 6.2-liter LT4 V8 powered pony car is just a few tenths of a second slower than the new Z06 to 60 mph. Thanks to its lower weight it is also quicker than the 707 horsepower Dodge Challenger SRT Hellcat. 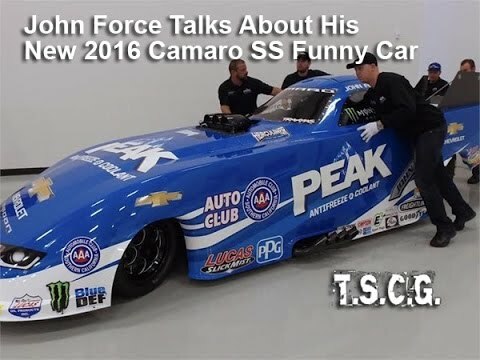 This past weekend John Force got his first opportunity to put his new ride to use. The 2016 Camaro SS Funny Car looked very good as it got ready to make a few runs on the drag strip. The first run in qualifying went well and put the car in 9th place for the NHRA event in Kansas. After the first run the team went to dial in everything for the next run. May 29th is the 100th running of the Indianapolis 500. For the special race the 50th Anniversary Chevrolet Camaro SS will be used as the pace car. Behind the wheel of the American muscle car will be motorsports legend Roger Penske who is celebrating 50 years as a racing team owner. To support the race four identical Camaros have been prepared. They feature a white exterior that has “100th Running of the Indianapolis 500″ graphics on the doors. The graphics also feature the iconic wing-and-wheel logo that the famed speedway is known for. The rest of the outside also incorporates styling that is uniques to the 50th Anniversary package. It is spring time and the 2016 Baseball season is almost here. We are just days away from the first pitch and Chevrolet continue a recent tradition that this year will feature the Camaro SS and Colorado. Both vehicles have received much acclaim, in fact they were named Motor Trend’s car and truck of the year. Both cars will be positioned behind centerfield of Comerica Park in Detroit, Michigan.